Original Artisan Cereal is handcrafted from our unique formula to taste delicious and provide the essential daily foundation for good health. Every ingredient has a specific purpose to work with the body, not against it. Each component of our cereal has been carefully selected to form a vital link in the nutritional chain. Most muesli's are put together from difficult to digest ingredients and empty fillers which can drain your body of energy while it struggles to break them down. This cereal works with your body, not against it. Original Artisan Cereal contains 18 essential ingredients each with a specific purpose to work with your body and provide vital antioxidants, micronutrients essential fatty acids Omega 3, 6 and 9, fibre, complex cabohydrates and protein. Our unique recipe and technique unlocks the nutritional content of the ingredients, making them readily digestible and bio available, whilst developing a delicious flavor and natural sweetness without any sugar. Each pack contains 10 concentrated servings of all natural ingredients with no empty fillers. 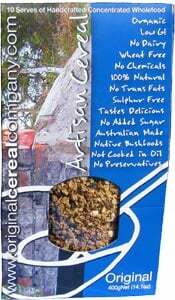 To complete this cereal we have included Australian native bush foods.